The Universal Cuff is ideal for children and adults with little or no hand strength. Can Withstand Use. Easy to Use. Convenient. Stays in Place. Home. Long Trips. Short Trips. Travel. Daily Use. A simple and efficient product. Very useful on a daily basis. Uncomfortable. Slot not large enough. Difficult to Use. Stiff. The slots for the utensils are not large enough to accommodate different sizes of untensils. My husband uses a large, heavier fork and this product does not accommodate the stem size of the utensil. The purchase was a total waste. Enables independence. Comfortable. Easy to Use. Convenient. Stays in Place. Severe Rheum. Arthritic. Total Permanent/Disabled. Due to my disability, I have used this type of Universal Cuff for over 30 years. I love the design and ease of use as it makes me feel very independent. Can Withstand Use. Comfortable. Easy to Use. Convenient. Stays in Place. Long Trips. Home. Short Trips. Travel. Daily Use. The Universal Cuff wraps around hand. The main purpose or use is for eating utensils. But I use them for other purposes like; typing stick, ink pen for writing, and tooth brush. Does the adult universal cuff come in small, medium and large, or just one size? Do you have to adjust the size to fit your hand for every time you use it? I have a universal cuff that comes in sizes that has an elastic cloth band on the back side. It seems to work well for me; but, I can't find it in these selections anymore. I'm a functional quad and have to be able to side it on myself. Would this type cuff work just as well for me? Thanks for your comments. Asked on Jun 16, 2011 8:49:09 PM by AL from N.C. I am a quadruple amputee who uses the cuff on my lower arm rather than a hand. It is a useful tool, I do snug it up and release it each time. I size down to the pediatric size. I'm a quad as well and like this better than the elastic ones. It has a D ring on it the I can either pull with my finger or with my teeth to velcro it in place. 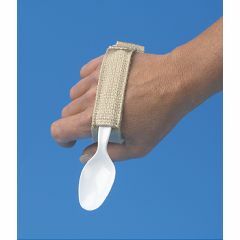 I use it with the utensil in the palm of my hand, not on the back on my hand as pictured. I'm a quad as well I don't use this cuff for eating I use it to hold my tooth brush and it works great the velcro makes it very snug so it doesn't in hand. I also use it in my palm not the back of my hand. You say your a functional quad have you tried OXO Good Grips Utensils for eating this is what I use. I'm also a quadriplegic. I like this one better since I can pull the D ring with my teeth and get the Velcro nice and snug around my palm. I use it to hold my toothbrush and also a pencil with the eraser end sticking out. The pencil substitutes for my finger and I use it to press all types of buttons (telephone, elevator, keyboard etc.). I use the eraser to turn pages when I'm reading a book or magazine. For eating I use the vertical palm utensils which I believe are made by Patterson Medical but are available from several medical supply distributors. I find the vertical palm utensils to fit much more securely and position the utensil in a much more efficient position. I bought this universal cuff to hold a capacitive stylus after my wife bought me an iPad. I am also a quadriplegic 24 years post, I use the Universal Cuff for brushing my teeth and I have to adjust each time. Works great for me. Answered on Jun 30, 2013 4:57:13 PM by cquad7 from Salem, Ore.